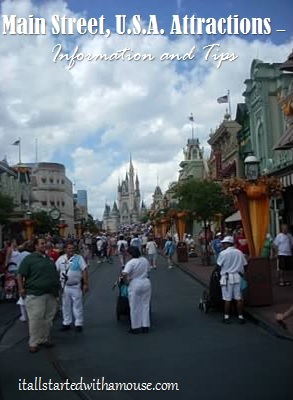 Below is a quick overview of each attraction within Main Street, U.S.A. area of Magic Kingdom. Vehicles run the length of Main Street, including horse-drawn trolleys, a fire engine, and horseless carriages. Operate daytime hours during off-peak season. Meet Mickey “backstage” at his magic show rehearsal! 20 minute ride roundtrip traveling 1.5 miles with stops in Frontierland, Fantasyland, Main Street, U.S.A.